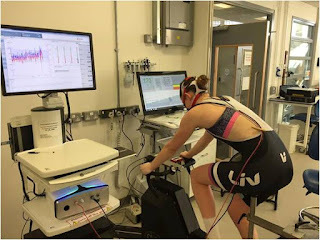 The purpose of this test is to decide the maximum power output you can accomplish and your maximum ability to use the oxygen you breathe in, to provide energy for working muscles (known as your VO2 max). You will start working at around 100 - 150W (this is the forces you put down on the pedals). It is depending on your fitness and body weight determines what level you start at. This workload will go up by 4W every 15s for females, and you will be required to cycle for as long as possible. Once you can no longer maintain your cadence within 10rpm of your chosen cadence the test will be ended. Throughout the test your oxygen uptake will be continuously assessed using an on-line gas analyser. Your maximum power output is calculated as the average power output over the last minute of the test. Your maximal heart rate will also be measured, as well as your blood lactate concentration 1-minute post-test, from ear-prick sample. The Max test I find the hardest, I’m not a big powerhouse so the numbers I push aren’t the greatest. However to use the test to your advantage you must compare the numbers agents yourself. Last March was the first time I had done the cycle test, I chose the wrong cadence which put me at a downfall. This year I choose 90rpm, my cadence was solid through the whole test. I went 2 minutes longer than last time and hitting more the 30w more. I was not happy my heart rate wasn’t at my max stopping at around 190bpm but my legs couldn’t go on. Showing my Heart was still in the game. This is a submaximal test to determine your cycling economy, training status and lactate and heart rate response to increasing exercise intensities. This test consists of 6 - 7 four minute stages (continuous) at intensities based on your maximum power output you did on the test before, from 30% of max power at the first stage up to 76 - 84% of max power at the last stage. Oxygen uptake and heart rate are assessed continuously throughout the test, and in the last 15 seconds of each stage, a small ear-prick blood sample will be taken. These blood samples will be analysed to determine blood lactate concentration. I found this test easier, as most athletes do, I made sure my cadence was smooth keeping it at 90rpm. I am yet to find out the results of the test but I am confident my turn point was better than last time. This test will determine my training zones. I will use the information I gain from this test when training. Riding at a certain HR on steady rides, tempo rides and so on. This will hopefully enable me to maximise my training and improve greatly. I will redo the test around March time next year and hopefully, with consistent training, there will be improvements. Thanks to LTPC, Nathan and Loughborough University for this great opportunity.